Au Revoir Les Enfants a commencé avec l'introduction de Julien, un garçon français va à l'école. Les garçons de l'école sont des brutes. Ils ont frappé un autre garçon, Jean Bonnet. Une nuit Julien se réveille pour voir Bonnet prière en hébreu. La père (le prêtre) demande Julien d'etre gentil se Jean, mais porquoi est un secret. Julien aide à Bonnet devenir plus sociale et aimé. Dans la période de temps, les Allemands traquent les juifs. Inconnu des autres enfants, Jean Bonnet est en fait Jean Kippelstein. Jean est un Juif. Joseph, un cuisinier, a déclaré Juifs sont à l'école où Julien et Jean est allé. Les soldats allemands viennent prendre les Juifs y compris Jean Bonnet. Julien vient comme Jean Bonnet est pris par les Allemands. Il est dit plus tard que Bonnet est mort à Auschwitz. This movie started out as every other French movie I've watched...slow. The movie portrayed a real situation which I was not expecting. I was thinking that this movie was going to be a comedy with some funny scenes, but I was wrong. Personally I don't like when a movie or a TV show makes the viewer become attached to a character only to take or kill the character away later on. I became a fan of Jean Bonnet especially because his name (or alias) is Bonnet (which is a funny last name). Bonnet was cruelly taken back to Germany and later killed in a concentration camp. Mood killer. I still enjoyed the overall story that the movie told, which was a movie of a friendship growing. This movie made me realize how much I appreciate my cheaply made Hollywood movies and TV shows. They give the happy ending that I like unlike this movie with a death. The movie was made with decent editing skills and sounded as though the sounds were real. Another plus to this movie was seeing snow because I love snow. All in all this movie was decent (without having to read an hour and forty-four minutes of subtitles) and I would recommend this movie to probably my mother and not a person my age. a. What qualities of French New Wave cinema can be seen in the film? A few qualities included were that it was taped on location and jumpy scenes. Several locations include a church, boarding school, and in the woods. This is opposed to what Hollywood usually tapes in (a set like Warner Brothers Studios). The jumpy scenes were included in the editing process because it went from one scene suddenly to a different scene. b. How do the colors, light, and surroundings affect the over all mood of the film? The colors used were mostly dark which effected the mood by setting it a little depressing and made the viewer not expect a sudden burst of happiness. 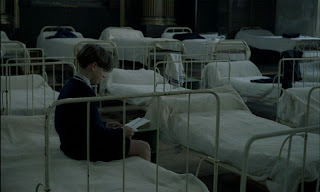 The light in the rooms and in the woods effected the mood by also setting up a theme of darkness and sadness. The surroundings included bad looking food, cold showers, peg sticks (used to play on), and cots to sleep on (frequently wet by Julien). These surroundings also contributed to the over all dark tone of this movie. c. What messages or themes is the film trying to convey? The film is trying to convey an event that happened in history (WWII and incorporation of Natzis along with Jews). The major message I think is that the Germans hated on Jews and ruined many lives by sending them to their deaths. Another message could be that Jewish children are like other children so they shouldn't be treated differently. Also, that non-Jews can be friends with Jewish children. A theme is innocence. Julien was naive to what Jews are and what Germans want with them for the majority of the film. d. Can you compare this film to any particular American film? How so? This film could be compared to Inglorious Bastards (sorry for the language, or a punny joke: pardon my french [get it? because it's a French project? haha]). I have never seen the forementioned movie, but it is a WWII based movie and it has people hunting Jews. Although they have little in common (just people looking for Jews to bring back or kill), they both take place in about the same time period. 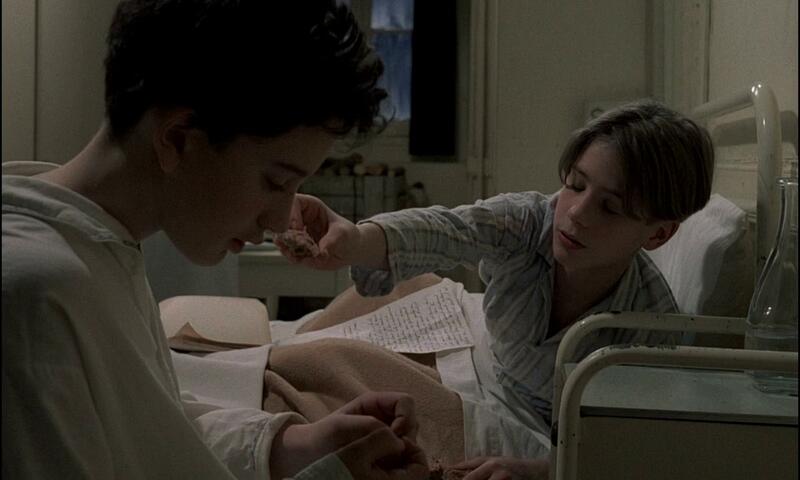 Other than Inglorious Bastards I cannot think of another movie that Au Revoir Les Enfants relates to.